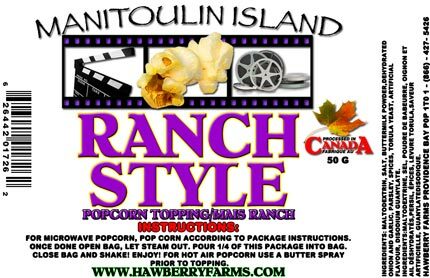 Click the button below to add the Ranch Style Popcorn Seasoning Party Pack to your wish list. Colourful packages of popcorn seasonings. Great for gift baskets, stockings or just to have a variety of seasonings around the home. Try it on oven baked french fries. Ingredients: maltodextrin, salt, buttermilk powder,dehydrated onion and garlic, parsley, spices, torula yeast, artificial flavour, disodium guanylate.